Left Behind – twelve novels that dramatize one evangelical perspective on the end of the world – is now established as the best-selling fictional series in American literary history. But it has been met with a range of critical receptions. This volume gathers essays by new and established critics of the series to interrogate the series’ significance and its cultural and commercial success, and includes, for the first time, a response to these criticisms written on behalf of one of the series' authors. 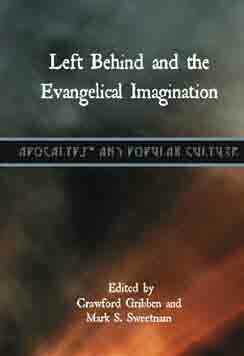 Mark S. Sweetnam considers the challenge that the organically theological nature of Left Behind has posed for cultural scholars. Amy Frykholm situates the novels’ discussion of gender within wider traditions of sentimental and domestic fiction. Jennie Chapman nuances the general assumption that the series’ conspiracy plots have been poached from secular accounts of subversion that emerged from the radical Right. Crawford Gribben contextualizes the treatment of Jews and Muslims in the rapture fiction tradition. Jarlath Killeen identifies a profoundly ambiguous attitude to Catholicism in the novels, accounted for by the emergence of lobbying and campaigning alliances between evangelicals and Catholics on a range of social issues. John Walliss outlines the manner in which rapture films speak to an evangelical audience, and addresses the failure of these films to gain significant crossover appeal. Katie Sturm interrogates the series’ ecumenical reflections. Marisa Ronan traces the role of Christian fiction in the shaping of evangelical identity. Thomas Ice addresses the theological background of the novels. Writing on behalf of Jerry B. Jenkins, Kevin Zuber responds to the criticisms provided by the volume’s contributors. This is the second volume in the series Apocalypse and Popular Culture; see also (1) Walliss and Quinby, Reel Revelations, (3) Howard, Network Apocalypse, (4) Partridge, Anthems of Apocalypse, (5) Clanton, The End Will Be Graphic, and (6) Aston and Walliss, Small Screen Revelations. Crawford Gribben is Long Room Hub Senior Lecturer in Early Modern Print Culture in the School of English, Trinity College Dublin. Mark S. Sweetnam is Research Fellow in the School of Language and Literature, University of Aberdeen.